In this Assassin's Creed Odyssey guide, we'll be walking you through ship combat, recruiting new crew members, the full controls layout, Exploration versus Guided mode, and more. If you instead need anything else at all to do with the latest entry in Ubisoft’s historical franchise, you’ll want to head over to our Assassin’s Creed Odyssey guides hub. It’s on this page that you can find all the beginner’s tips and tricks you need for adventuring around Ancient Greece as either Kassandra or Alexios, and much more. 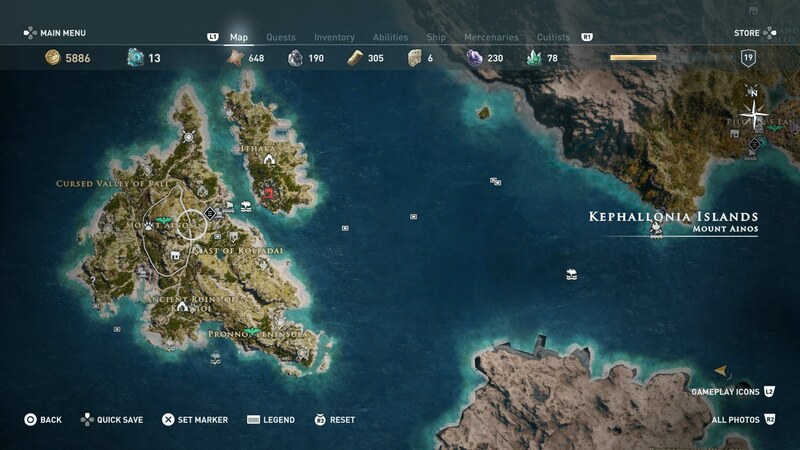 When you first start out the grand adventure of Assassin’s Creed Odyssey, you’ll find yourself on the island of Kephallonia. It’s a relatively small location, as pictured just below, but after you’ve dealt with the Cyclops and left Markos and Phiobe behind, the entire world opens up for you to explore through your ship. 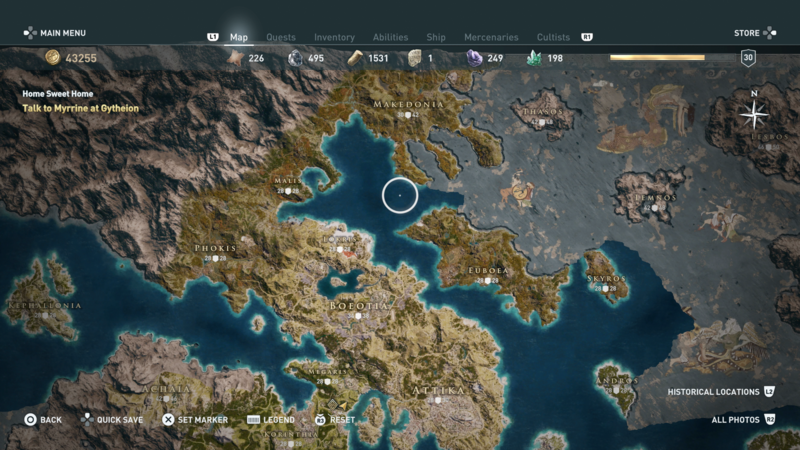 Just below, you can see screenshots of the huge world of Assassin’s Creed Odyssey. The world map is so big that we couldn’t even get it on a single screenshot. You’ll note below that while some areas are colored in, other areas of the map are grey. The colored regions are the places that we’ve been to and explored, while the grey areas are uncharted territory. You’ll note that there are level recommendations for each area of Assassin’s Creed Odyssey. Generally speaking, the more dangerous regions are found towards the southern end of the map, while the northern areas are generally at a lower level, usually below 20. Whenever you see a fast travel point, which is denoted by a white eagle on the map, you’ll want to travel to it immediately. Climb the point once you’ve reached it, and press Y/Triangle to ‘Synchronize’, allowing you to fast travel back to this point in future. Exploring is generally pretty rewarding in Assassin’s Creed Odyssey, as you can find tons of side quests with interesting characters (some of which you can even romance). 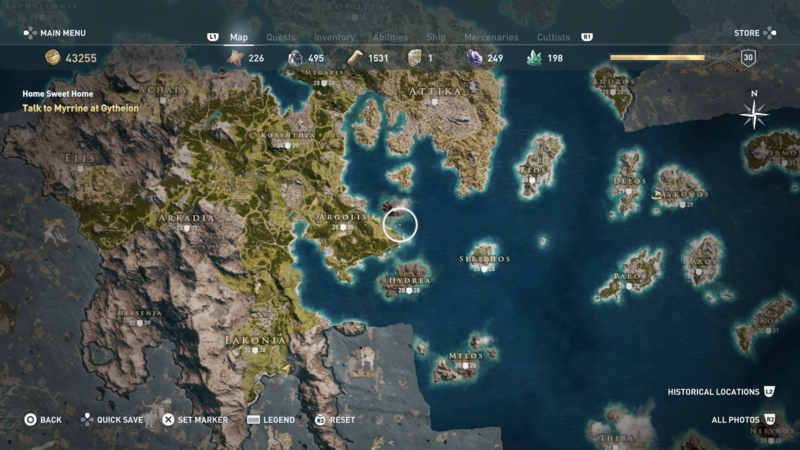 Now that we’re all done with this general overview of the Assassin’s Creed Odyssey map, you can continue ahead to any of our additional guides on the game. 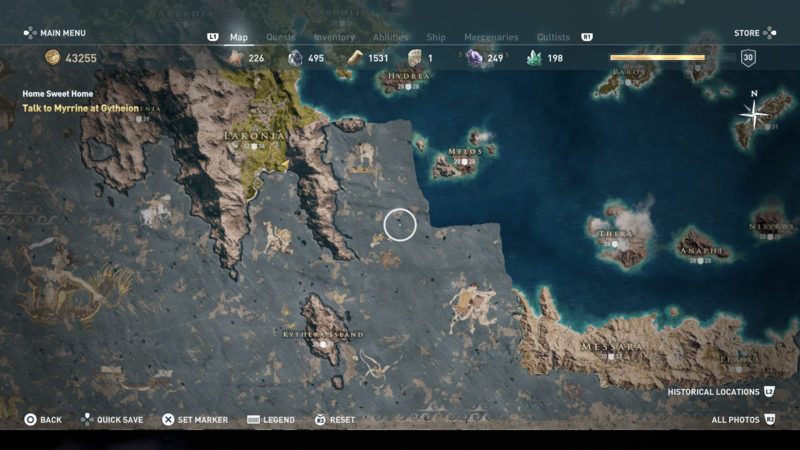 You can check out either our Assassin’s Creed Odyssey Atlantis Pieces guide for how to locate the four pieces, or our Assassin’s Creed Odyssey Crew guide, for how to recruit Legendary crew members for your ship.